So in case it's not, like, super freaking obvious... Ginger and Kara are both massive Doctor Who fans. (We know... huge shock, right?) Between us we've been involved in a variety of print, television, and live events concerning the show and its creatives. And Ginger has decided to go all in and create a charity fanzine for the Twelfth Doctor and Clara. 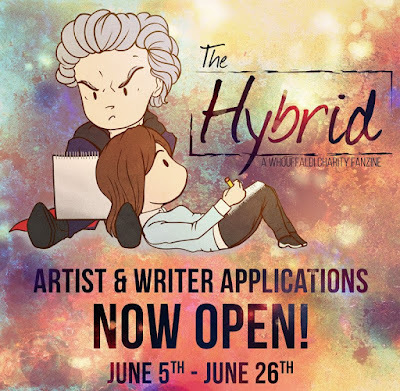 Titled The Hybrid, it will consist of new stories and art created by fans, focusing on the relationship between the two characters. And you don't have to be a shipper -- the contents can examine their time together at whatever speed you wish. Best of all, proceeds from the zine will benefit One to One Children's Fund, for which Jenna Coleman is an ambassador! Applications are open now for writers and artists. So if you're a Doctor Who fan, want to create something for a good cause, and want to work with the people behind Owl's Flower (yep, Kara will have a story in it! ), hit up the zine on Tumblr to apply! You don't have to create a work to apply: just send in examples of previous work for now. You can also keep an eye on the zine's Twitter, @TheHybridZine. Not a creator yourself but know someone who is? Please pass this along! We can't wait to work with you!